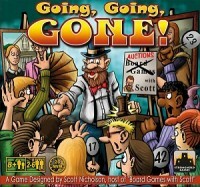 BoardGaming.com> Games> Party Games> Going, Going, GONE! In Going, Going, GONE!, players try to win items by bidding on five simultaneous auctions while the Auctioneer counts down from 10 to 1! Players bid on these five simultaneous auctions by physically dropping their wooden cubes (known as "Bucks") into any or all of the five transparent Auction Cups, each of which represents an auction for one or two Item Cards. At the end of the countdown, the Auctioneer says "GONE!" and quickly places the Auction Paddle over the five Auction Cups to close the auctions. The player who has the most Bucks in each Auction Cup wins that auction and takes the Item Cards for that auction. Collections of items may be sold throughout the game for more Bucks, or players can keep building their collections to sell them at the end of the game. The player with the most Bucks at the end of the game wins! Add a Review for "Going, Going, GONE!"